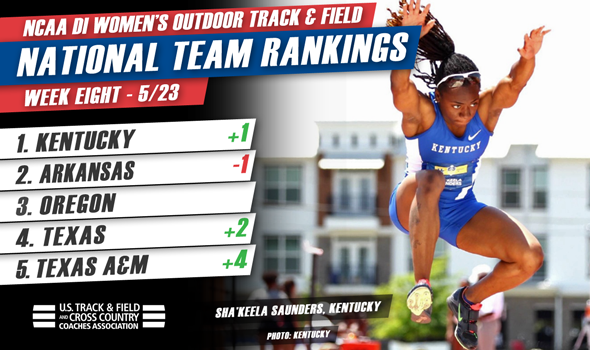 NEW ORLEANS — Just when you thought the National Team Computer Rankings in NCAA Division I Women’s Outdoor Track & Field would settle down ahead of the NCAA Prelims, you got another thing coming. It’s clear through the most recent rankings that were released Monday by the U.S. Track & Field and Cross Country Coaches Association (USTFCCCA) that Arkansas and Kentucky are the favorites based on entries to the NCAA postseason — but not necessarily in that order. After being upended last week following a two-week stay atop the rankings, the Wildcats are back on top behind a 19.8-point swing. The Razorbacks, who had been up by an incredibly small amount in Week 7, fell to No. 2 (a spot they have no occupied four times this season). Kentucky and Arkansas are the only teams in the National Team Computer Rankings with more than 300 points. Actually, the Wildcats and Razorbacks are upwards of 350. Comparatively, Oregon, Texas and Texas A&M — the next three teams listed in the rankings — tallied 273.67, 226.34 and 208.83 points, respectively. That top-5 is actually quite fitting, considering those five programs own the five most postseason entries — but not necessarily in the order they’re ranked. Arkansas leads the way with 33, followed by Oregon and Texas A&M (both with 32), Kentucky (31) and Texas (29). With 23 entries, Stanford moved up three spots from the previous week (No. 10 to No. 7). That marks the best ranking in team history for the Cardinal as it tops the previous record of No. 8 set in Weeks 5 and 6 this season. A team going in the opposite direction is Kansas State. The other Wildcats (not the top-ranked version) fell seven spots from No. 5 to No. 12 after standout Akela Jones didn’t declare in the high jump, long jump or 100 hurdles and instead elected to focus on the heptathlon and a showdown with Georgia’s Kendell Williams. Outside of Stanford and Texas A&M, three other teams improved by three or more ranks: Mississippi State, Alabama and Michigan. The Bulldogs went from No. 16 to No. 13, the Crimson Tide rolled from No. 25 to No. 22 and the Wolverines joined the top-25 after jumping from No. 29 to No. 25. NCAA Prelims are this weekend with action taking place in Lawrence, Kansas (West) and Jacksonville, Florida (East). Those athletes who shine the brightest will then head to Eugene, Oregon for the 2016 NCAA Division I Outdoor Track & Field Championships set for June 8-11 at Hayward Field.